Hello crafters! 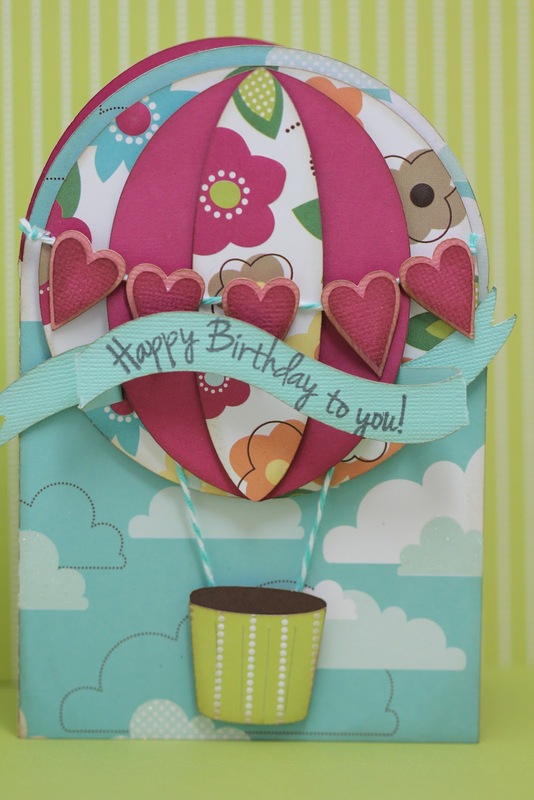 This is Kate from Small Bits of Paper and today I have a "springy" card to show you. Here in my part of Canada, we've had a very snowy February and I am more than ready for spring! 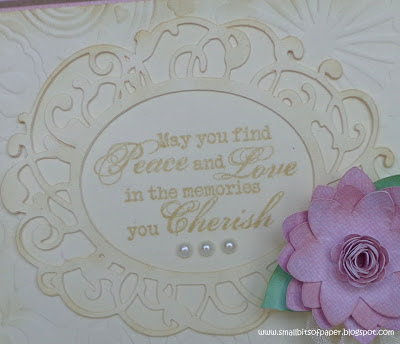 I embossed the background of my card with a folder from Stampin' Up. 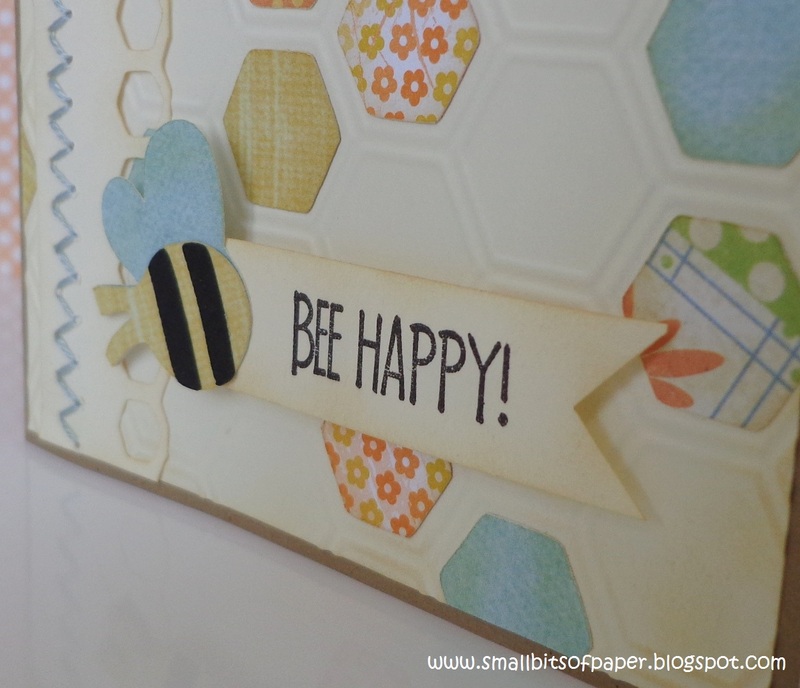 Using my Cricut, I cut little hexigons from Accent Essentials, using several pieces of scrap paper to vary the colours and patterns. 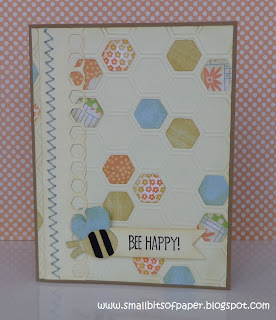 (I did need to stretch the hexigons to make them fit the embossed portions of my card.) 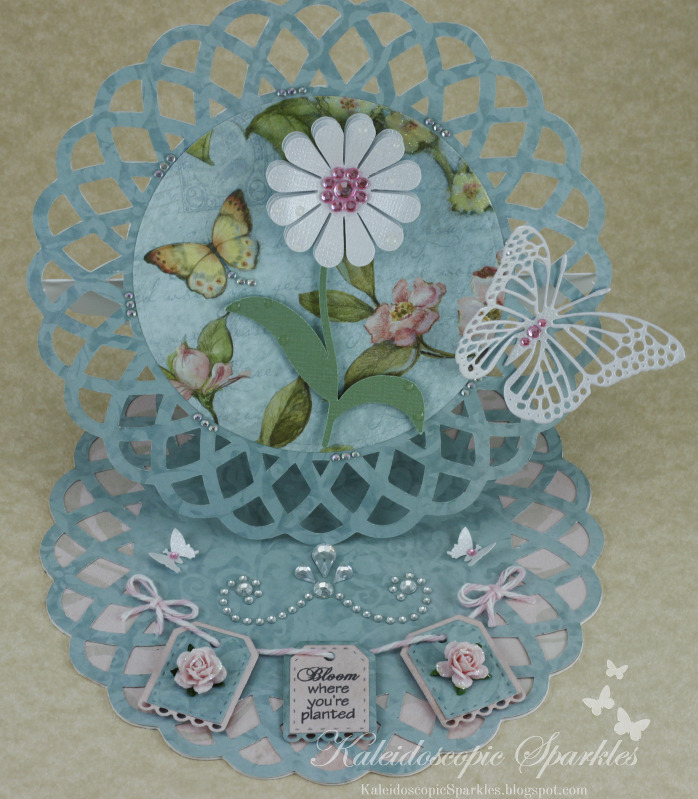 I also used Accent Essentials to create the little border at the side of my card and then handstitched the zigzag in blue. 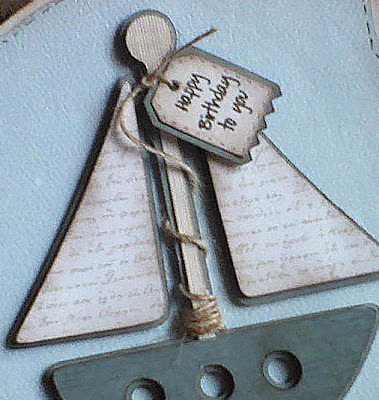 The little sentiment tag was handcut (using a square punch on the diagonal for the pennant end). 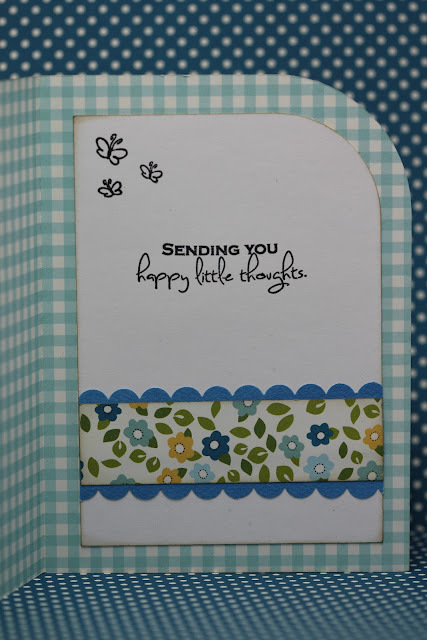 I stamped the tag with a fun sentiment from My Craft Spot's Sweet Sentiments - Set #2. My little bee is from Walk in my Garden. I popped the sentiment tag and bee onto my card to add even more dimension. 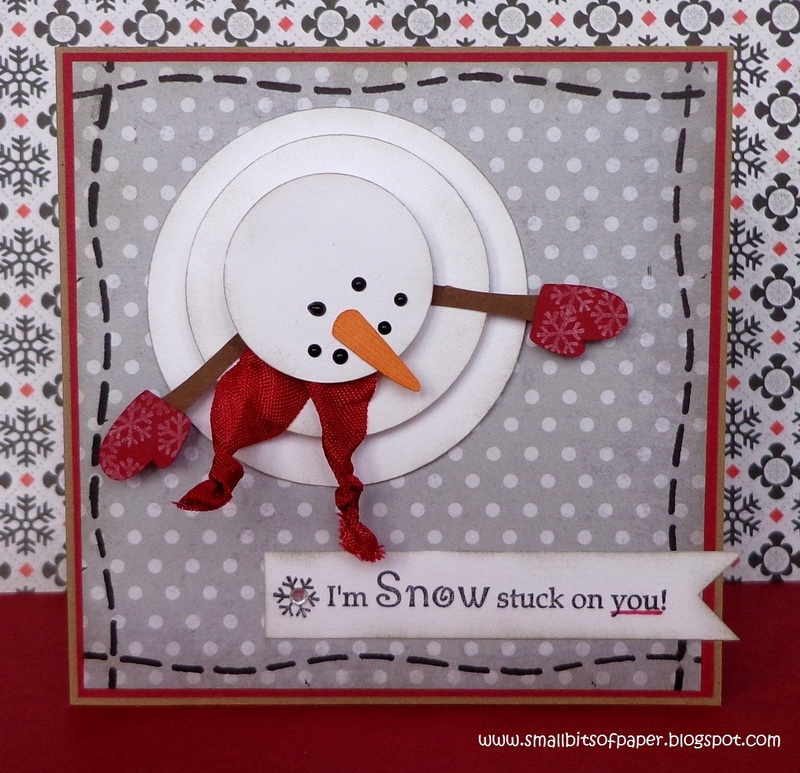 Don't forget that this week's challenge at My Craft Spot is "Pop it up!" 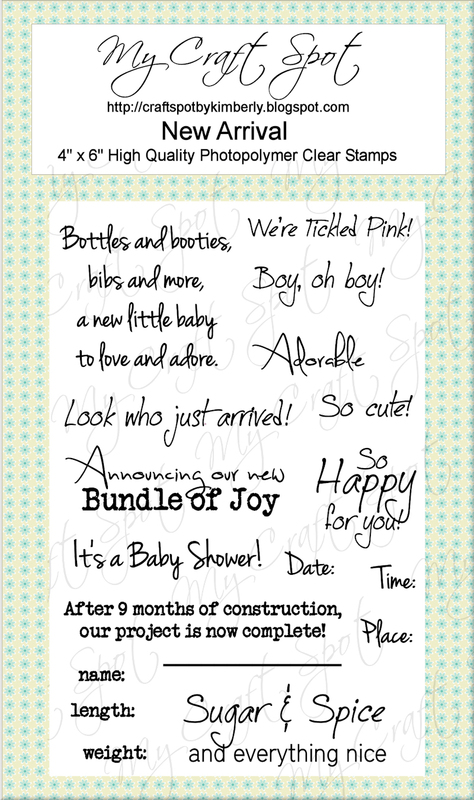 You have until Monday to link up your own project to be eligible to win this week's prize - a New Arrival stamp set. Thanks for dropping by My Craft Spot! Have a fantastic day! Hello everyone! 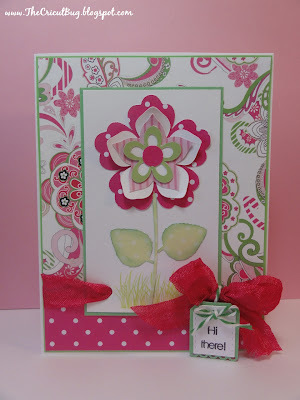 This is GiGi from The Cricut Bug here to share a card that I did. 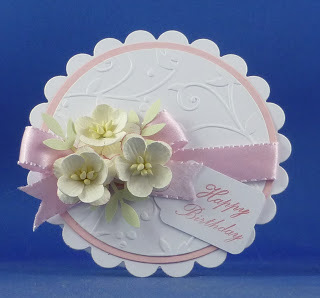 I used My Craft Spot's Tiny Doilies Dies and Lacy Banner Dies on this card. Can you see where? I also used the Birthday Wishes stamp set. I cut the monkey from the MP3 Monkey SVG Cutting Files. I hid the eyes and stamped the eyes and nose using Peachy Keen face stamps. I also opted to not use the MP3 player. 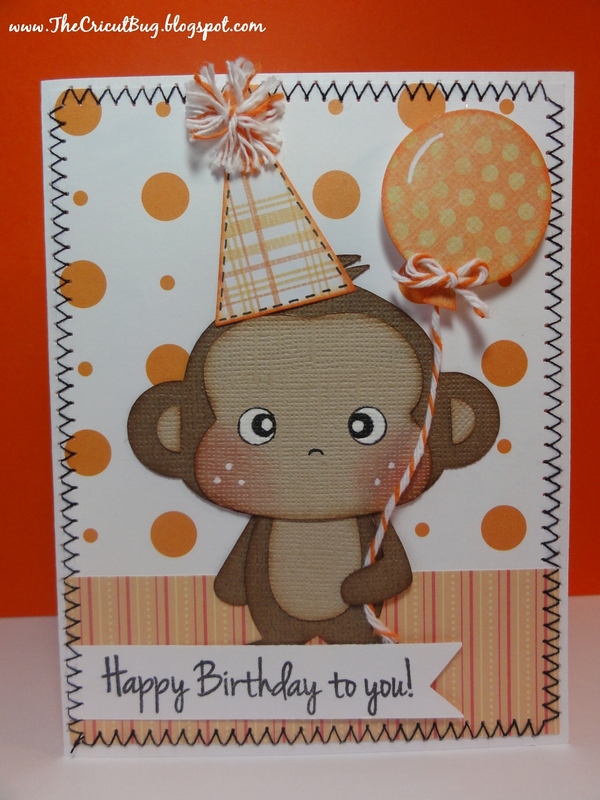 The hat was created by using MCS's Lacy Banners Die and I added a twine pom to the top using Orange Divine Twine. The balloon was made using MCS's Tiny Doilies Dies and I hand cut a piece for the bottom of the balloon. I attached some twine from the balloon to his hand and pop dotted the balloon. 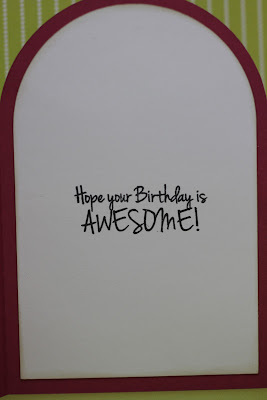 I used my sewing machine and did a black stitched line around the card and stamped the sentiment onto a banner using MCS's Birthday Wishes stamp set. I hope you all liked my card and thanks for stopping in! Have a great day! We had so much fun looking at all of your beautiful flower projects! Thanks for joining the fun!! Congratulations #41 - Arin F.
You won the Traditional Bakers Twine Pack! Hi everyone! Are you ready for another fun challenge? This week's challenge: Pop it up! GiGi's bee is absolutely adorable! Love the eyes!! GiGi's stamped sentiment is from the Thank You stamp set. Gwen's hot air balloon is amazing! The colors are so fun! I love all of the many dimensional layers on Gwen's fun card! 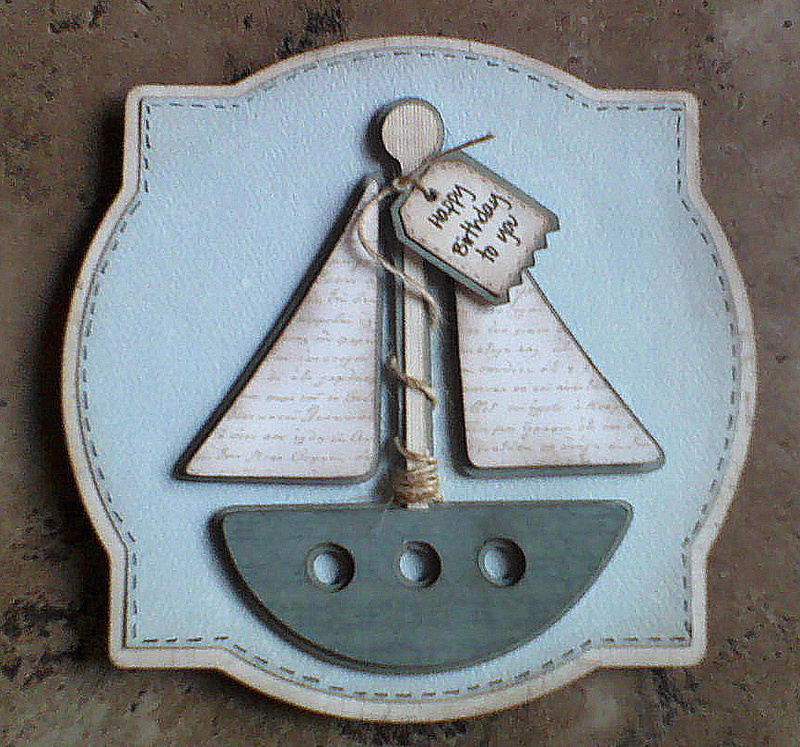 She used Caribbean bakers twine on her basket and banner. 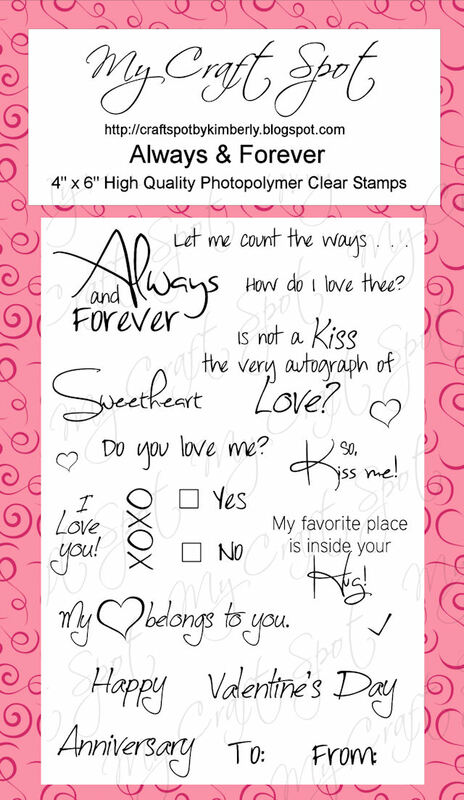 Gwen's sentiments are both from the Birthday Wishes stamp set. Sherrie's monkey is so cute and I love how she wrapped her (Pink Sorbet) bakers twine around the heart and banners border - so pretty! Popping a die cut up off the card a bit adds so much! 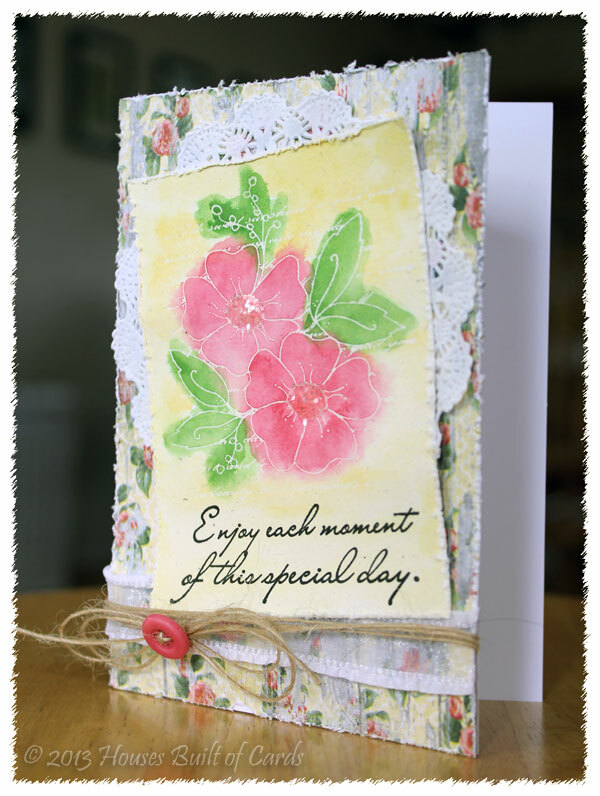 Sherrie's sentiment is from the Birthday Wishes stamp set. I LOVE Kate's cute snowman! What a fun perspective! I love how the scarf (Cranberry Crinkle Ribbon) sticks out from between the layers! Kate's fun sentiment and little snowflake is from the Think Snow stamp set. 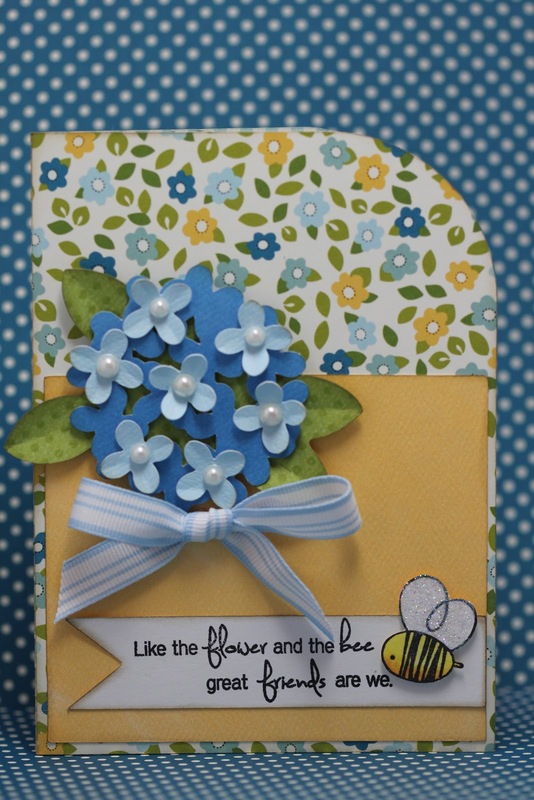 DT post by Gwen - Like the Flower and the bee. 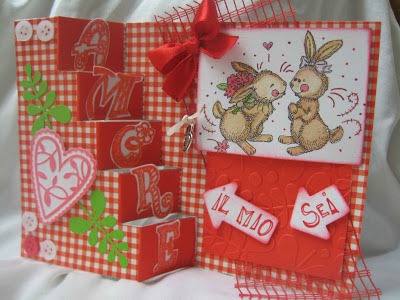 . .
Hi everyone, this is Gwen from This and That by Gwen, with a springy card to share with you. 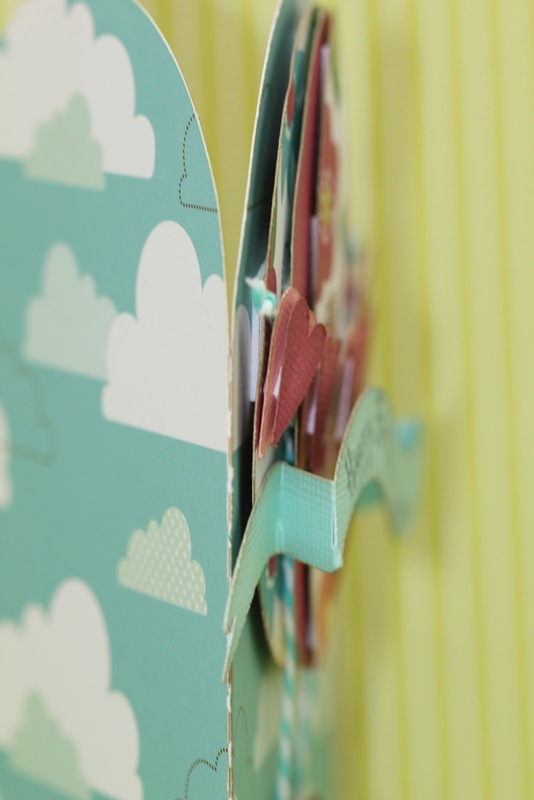 I love these fun papers, they are from Pebbles, to me they just scream spring! This was made with a file from SVGCuts, I did make a few changes though. The sentiments are stamps from the Butterfly Kisses stamp set from My Craft Spot. 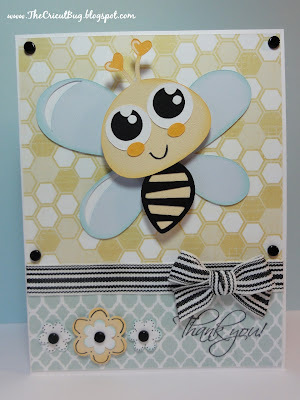 The little bee was stamped and colored in with markers hand cut and glitter added to the wings. I taped one end of the Natural jute twine behind the base of the boat and then wrapped it around the mast, tying it off at the top to attach the tag. 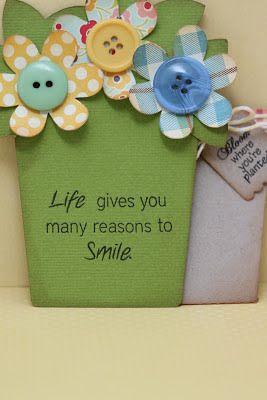 I cut the tag layers with the Tiny Tags metal dies and then stamped a sentiment from the Tiny Tags stamp set. The jute string is really fun to work with and is this month's deal of the month! Get all 10 colors for only $12.99! As always, shipping is free in the U.S.
Hello My Craft Spot Crafters! 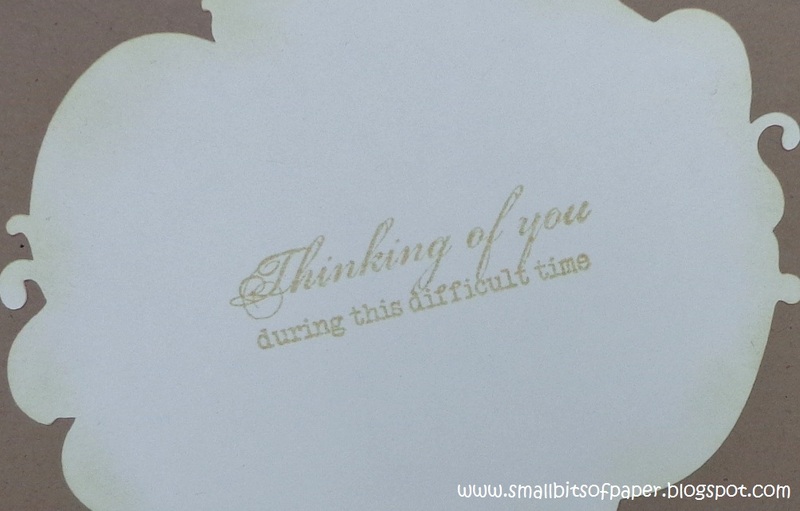 This is Kate from Small Bits of Paper and today I'm sharing a sympathy card that I created using products available here at My Craft Spot. 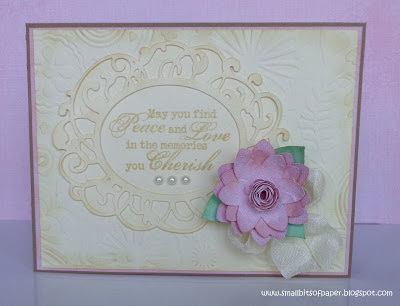 I used Fancy Frames to create the frame to highlight the beautiful sentiment from the With Deepest Sympathy stamp set. 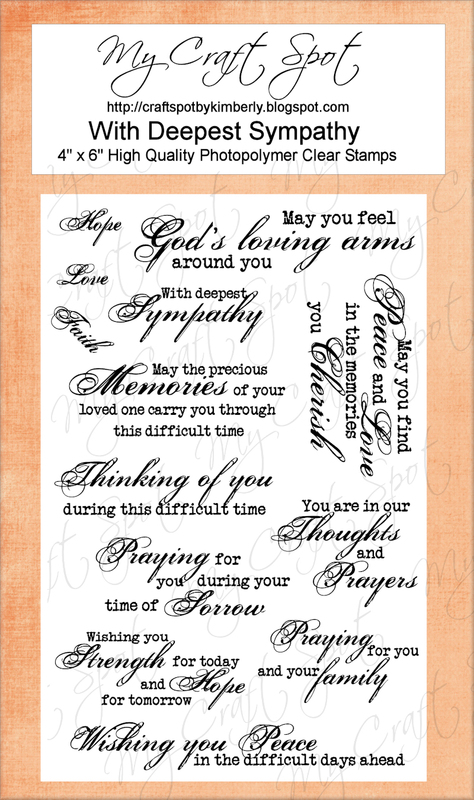 The font on this set is simply gorgeous and there are such heartfelt messages available to choose from. (You can click on the image of the stamp set to enlarge it for a closer view.) 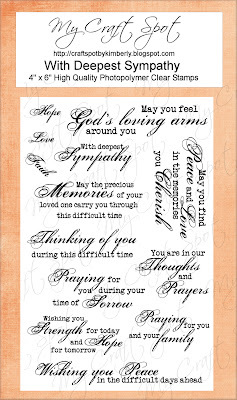 These messages are perfect for projects of sympathy following the loss of a loved one - but also for projects of encouragement when others are going through troubled times. I embossed the background using my Cuttlebug and also assembled a flower using cuts from Flower Shoppe. To finish things off, I added three little pearls under the sentiment and some fabulous Vanilla Bean crinkle ribbon. For the inside of my card, I cut the outline of the frame used on the front and stamped another sentiment from the With Deepest Sympathy stamp set. 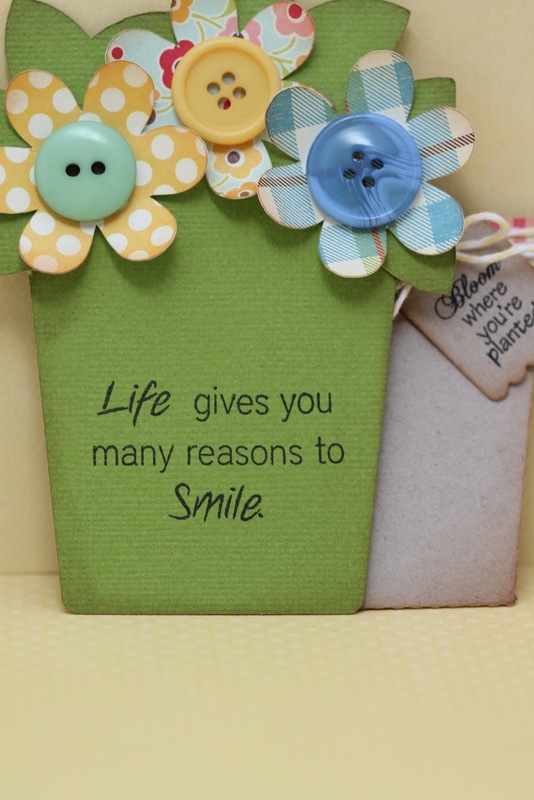 Have a wonderful day - and thanks so much for visiting My Craft Spot! Right now as I look out my window, we still have a foot of snow outside. I am so ready for Spring and flowers!! The watercolor effect of Heather's flowers is absolutely gorgeous! What a beautiful card! 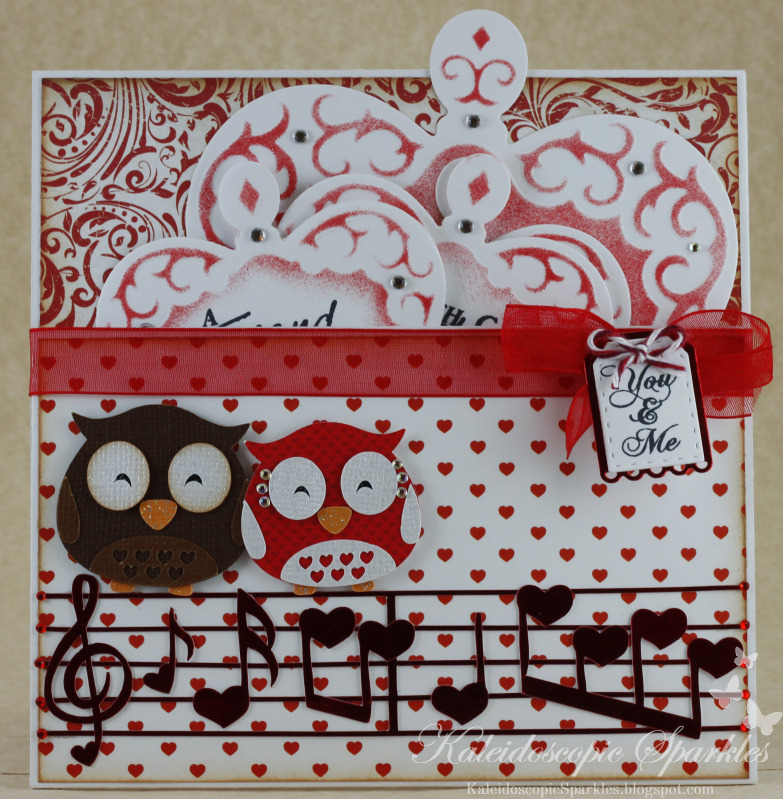 Heather's stamped sentiment is from the Happily Ever After stamp set. She added a bit of Sheer White ribbon and tied Natural Jute Twine around the bottom of her card. Gwen's card is so fun! 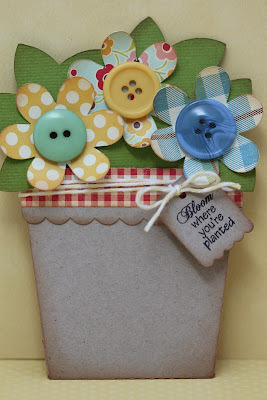 I love how the flowers slide out of the pot and her button flowers are very cute! Gwen's inner stamped sentiment is from the Friends & Neighbors stamp set. 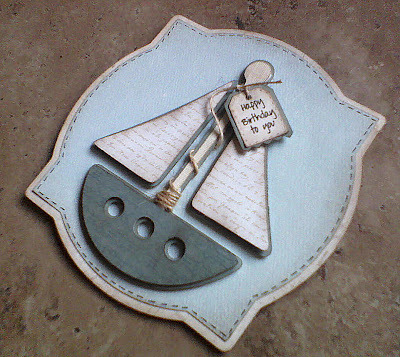 Her cute tag was cut from the Tiny tags metal dies set and stamped with a sentiment from the Tiny Tags 2 stamp set. She attached her tag with Buttercream bakers twine. 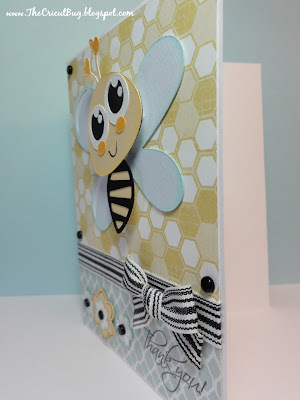 I love the cute bee on Sherrie's beautiful card! Her paper flowers are gorgeous and I love the pretty frame! Sherrie tied a bit of Blueberry Trendy Twine on her cute bee. Her fun sentiment is from the Butterfly Kisses stamp set. I love the fun papers and colors GiGi used for her beautiful card! 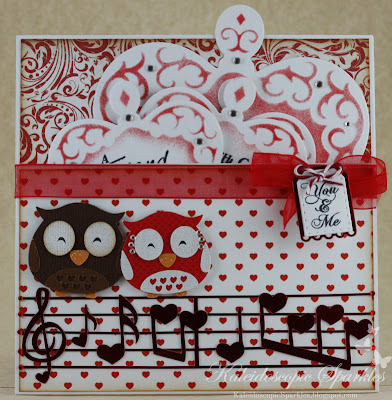 GiGi used the Tiny Tags metal dies to cut her tag and then stamped a sentiment from the Inside & Out #2 stamp set. Her pretty bow was tied with Hot Pink Crinkle Ribbon and she attached her tag with Peapod Twinery bakers twine. 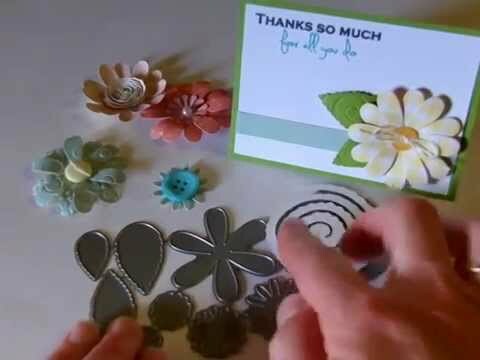 Robin's paper flowers are gorgeous!! I love her stitching and the soft colors are so pretty! Close up of the beautiful flowers! Robin tied a piece Buttercup crinkle ribbon around her pretty card. 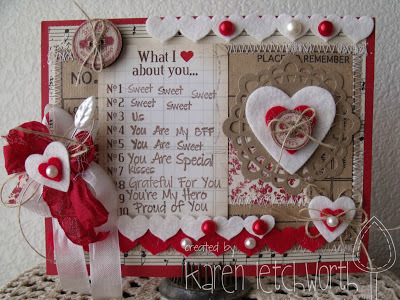 I love how Robin stitched her sentiment tag onto her card! 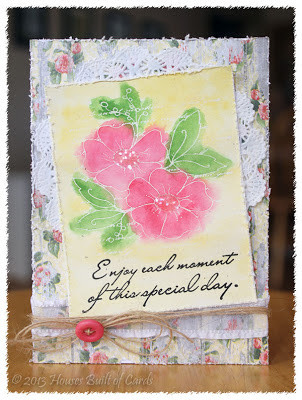 The sentiment is from the Sweet Sentiments #2 stamp set.